“Raindrops Keep Falling on My Head” may have been a terrific tune in the ’70s, but it’s a sad song to sing if it happens when you’re standing in the middle of your own living room. Of course, you’ve called a reputable licensed roofing contractor, but what do you do until the roofers get to your house? 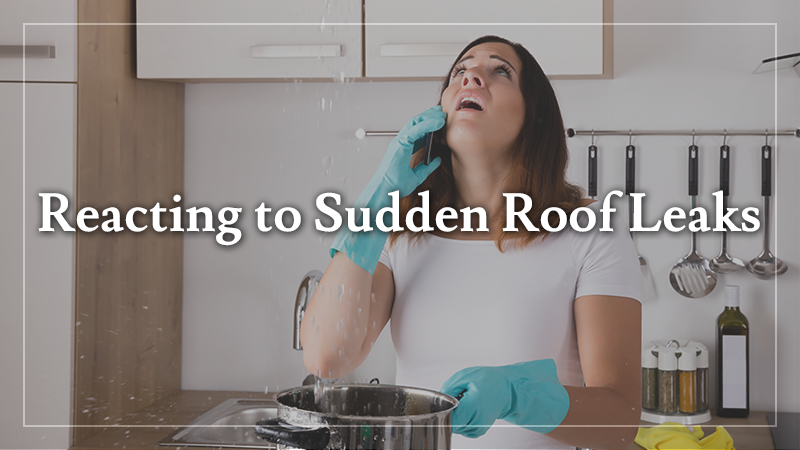 Whether it’s dripping or cascading, it’s causing damage to not only the ceiling but to everything above and below it — furniture, flooring, carpet, attic insulation. And your problems are bound to get worse if you don’t act right away. It may take at least a day for roofers to arrive and maybe longer if the leak occurs in the middle of a major storm when other homeowners are calling for assistance as well. So, as helpless as you may feel right now, stop staring at that spot in the ceiling and get busy. Get to know your leak: It’s been brewing for a while, pooling above the ceiling until it found a spot where something had already breached it. Lighting fixtures, heating vents, and skylights are all preferred ports of entry. Yes, by all means, place a bucket underneath this spot, but don’t stop there. The water will eventually find other weak areas, and your leaks will multiply. The only way to stop them is to locate the spot where the water is pooling. This will look like a bulge in the ceiling. Poke a hole in it and let it drain all at once. Yes, you’re intentionally damaging your ceiling, but you’re also stemming the damage. Do a Background Check: Once you’ve consolidated your leak, and placed a bucket under it, your next step is to find the spot where it’s entering. Roofers and construction workers will tell you a wet roof is never a safe place to be, but you can usually locate the leak from the attic. If you have a pitched roof, don’t expect the entry point to be directly over the ceiling leak. Rain tends to enter a compromised spot in the roofing material, and will then travel downward to the closest joint in the roof decking. If you find it, roofing tape or roofing cement can serve as a temporary repair until the roofer can get there. Placing a tarp underneath the roof leak can also help. Don’t Try This at Home: Although securing a tarp is the best way to stem a leak, unless you’re a licensed roofer, it’s not something that is recommended as a DIY fix. When the roofing contractor gets there, after a thorough examination of your roof, he will most likely put a tarp in place, and this should do the job until he and his crew can get to work on the repair. Your roof may develop a leak sooner or later, especially if you live in an area with extreme weather. 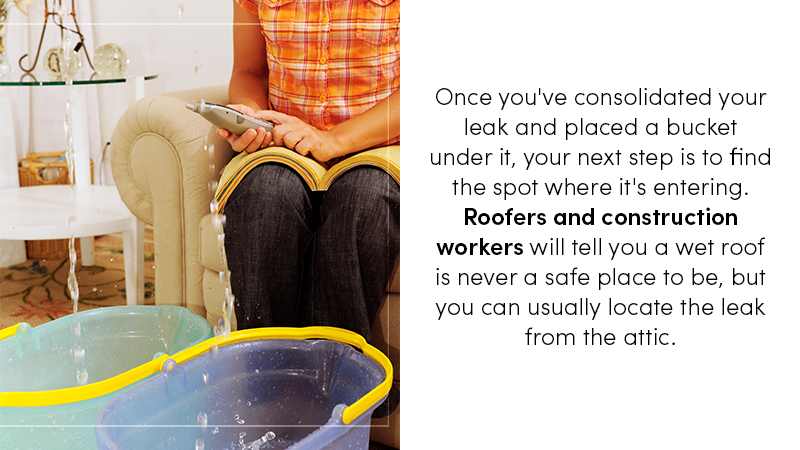 However, you can hold off those leaks longer if you keep an eye on your roof all year round. Take a look at the flashing around your chimney, plumbing vents, and (if you have them) skylights and satellite dishes. Are they flashed properly, and is the flashing in good condition? Don’t forget the dormers and roof-to-wall transitions. How about the shingles? Are any of them buckling, loose, or missing? Don’t underestimate the importance of the gutters. Are they securely attached and clear of debris? Do they slope properly? Improperly installed or deteriorating flashing, compromised shingles, and water-filled gutters can all contribute to a future roof leak. If any of these conditions apply to your roof, your licensed roofing contractor can repair them. At L&L Contractors, we’re here for all your exterior and roofing needs! Give us a call today to schedule an appointment, and don’t forget to stay up to date on completed projects and helpful tips on our blogs!